Oostveenseweg 11a, Schipluiden. This is the address for a farmhouse 20 meters down the road, on the opposite side of the street. So, if the farm is to your left, the ‘parking’ is about 20 meters before it, to your right. I use quotation marks because it is more like a tiny dirt shoulder on the side of the road (just enough for one single car). 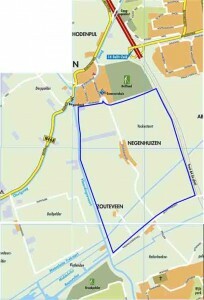 I could not find a map showing a consistent outline fo the Vockestaert polder anywhere, so I traced the area I covered (blue line on the map). From what the locals tell me, the entire polder except for some pasture areas (where on-leash restrictions are clearly sign-posted) are off-leash. I must say: I did not see any sign that offleash was allowed. I did, however, see only one sign regarding dogs, and that one said that they had to be on-leash for a small part of the domain. This makes me assume that the rest is, indeed, offleash. I would not know which municipality to contact about this to find out for sure, as the domain is, awkwardly enough, a patchwork of Vlaardingen, Schipluiden and Schiedam lands. The above terrains are separated here and there by a combination of straight and meandering little rivers criss-crossing the area. The views stretches very far, what with it being mainly flat, so you can spot some city-scapes relatively far away in the distance. It is tricky to find, and next to impossible to park from the angle I have found. I must research a better access. A couple of small back-roads cross the otherwise peaceful polder, and the occasional traffic (one car every 5 minutes or so, depending on the time of day) can get a little annoying after a while. The polder is crossed by several bicycle lanes and, at times, there is no alternative pedestrian path, so you get the usual mini-conflicts over who must give way, and the dog can be considered a nuisance by cyclists. 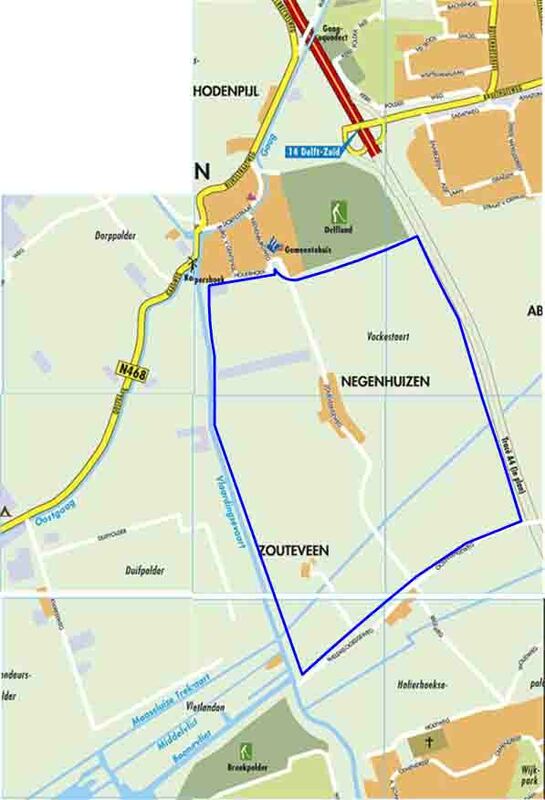 The polder is in between several municipalities (Schipluiden, Vlaardingen, and Schiedam) so it is really confusing to ask for your way with any certainty, or to know what the exact rules and regulations are. The polder landscape is not for everybody. It can feel boringly flat and uniform after a while. The plans to cut the polder with the long-awaited extension of the A4 motorway seem to be finally taking shape – they have laid out the first roadworks markers already.